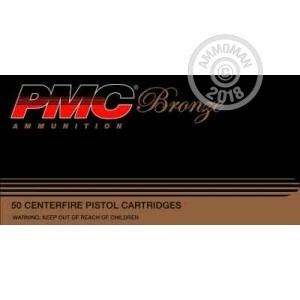 This .44 Remington Magnum ammo from PMC is a great choice for revolvers and carbines. Made in South Korea by a top defense contractor, it uses a 180 grain jacketed hollow point bullet and comes packaged in a case of 1,000 rounds, with 20 boxes of 50 rounds each. It performs well on the range or in a self-defense situation, but finds an even stronger niche as a hunting round. Though perhaps best known as Dirty Harry's carry load, the .44 Magnum's usefulness extends far beyond the venerable S&W Model 29. Manufacturers such as Ruger, Henry, Winchester, and Marlin all produce popular carbine-length long guns that turn the .44 Magnum into a powerful mid-range cartridge effective against small and medium-sized game. Ammo prices at stores in your area got you down? Get great prices AND free courier shipping with any order over $99 from AmmoMan.com. You pay only the list price.